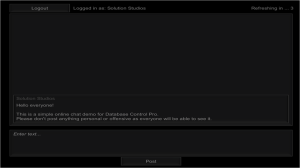 Database Control Pro is the perfect solution for creating a online server backend for your game. It allows you to implement systems such as, simple online loading and saving, complex accounts, in-game news, loading assets at runtime, storing player statistics, basic analytics, online chat, ... and so much more! Pay once use forever, only $35 until v1.1 update. What makes it different to the other Asset Store database packages? It is unique. You don't need a server. You don't need any extra knowledge. You don't need to worry about security, hosting, storage or backups. No hidden costs or subscription. No coding required. Multiple demo templates to choose from and if you want extra features, you can add them yourself with an easy-to-use visual scripting solution. Create as many databases as you need for your project. You can use the same databases over multiple projects. Our databases look a bit like spreadsheets (think Microsoft Excel/Google Sheets). You can store a string in each cell. You can customize how our server responds to any request your game/app makes to it. This can be done using a custom built Drag and Drop visual scripting system within the Unity Editor. The Database Viewer Window allows you to view and edit your databases (just like editing spreadsheets in Excel/Google Sheets) within the Unity Editor! All you need is Unity and Database Control Pro. We provide the hosting. We provide the storage. Just a one-off payment any you can use it as much as you like. We've done all the hard work so you don't have to. You can setup a demo scene in minutes, use them in your game and edit/customize them. There are 4 main demo scenes and a couple of others to help you out. The Login Demo - A basic login/register system with a single data string you can save and load per account. It is based on the demo scene that comes with Database Control (Free). Third Person Demo - This demo scene is has a login/register system allowing you to login to a third person game with a basic inventory. It also stores the last postion and rotation of your character and loads it when you login again. The Chat Demo - This demo scene is a working online chat. The player just types in a username and is able to post messages to all other players. The City Constructor Demo - A more complex demo similar to modern RTS games. Login, Register, Build Upgrade Sell & Move Buildings, Daily Rewards and more. There are links to all the demo scenes (further down this page) for you to try them out before purchasing Database Control Pro. We extended Unity's UI System with our own Animation System built specifically for Database Control Pro. It allows you to create some great looking transitions and animations. The DCP Features Video was created using it. And the DCP Demo Scenes also use it. We support all versions of Unity from Unity 4.6 onwards. If you find DCP has problems in a specific Unity version please contact us and we'll fix it. All our code is written in C#. It is clear and well commented. We don't include the source code for Database Control Pro itself but the source code for all Demo Scenes and the UI Animation System is included. Although UnityScript has been depreciated by Unity, we still support it! Database Control Pro should work on all Platforms providing the device has an internet connection. However, we have only been able to test it on Desktop, Web Player, WebGL and Android. We keep the documentation for DCP online. You can find it here. We've recieved many compliments for the clarity and usefulness of the documentation from our users. When you purchase Database Control Pro, you recieve all future updates for free! We make manual backups of all databases stored on our servers at least once a month. If you loose any data just let us know and we'll help you restore it. DCP uses SSL for all data transfers. This makes it secure against anyone listening in on your internet connection. If you find any bugs or just have a question while using Database Control Pro, you can let us know without leaving the Unity Editor! What can DCP be used for? A simple login/register system where a data string can be saved and loaded to/from the player's account. An application of a simple login/register system where the player's position and inventory can be saved and loaded. A online chat system which is saved to a database so a player can close and reopen the game and continue from where they left. A more complex demo similar to modern RTS games. Login, Register, Build, Upgrade, Move, Sell, Daily Rewards and more. Learn how to Setup Database Control Pro in your project and get the demo scenes working. Uses the Demo Scene we set up in Tutorial 1 to explore all the DCP Editor Windows. Shows the basics of how to use the UI Animation System included in DCP. Just need a simple Login/Register System?